ZAP First Jump by Clarin Global S.A. is a adventure style platform jumper app for the iPhone and iPad. 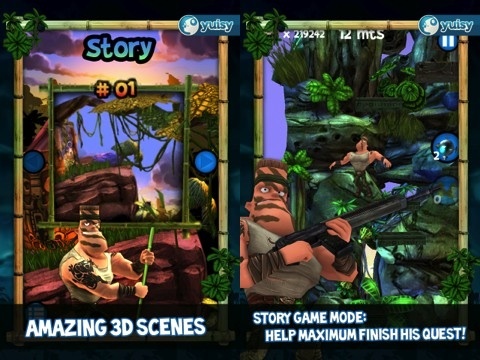 The game’s hero is named Maximus, who is lost in the jungle surrounded by bugs and traps. Your job consists of navigating Maximus through the jungle by jumping from platform to platform killing bugs. When you start a game, Maximus jumps up high and your job is to tilt the iPhone or iPod touch in the direction you want him to land. Each platform maintains a trampoline-like effect where it propels him upward. You tilt your phone to the direction you want him to land. Some platforms have power up ability which propels Maximus higher than the standard platform. As you land on platforms, you smash the bugs walking along them. Be careful jumping. When you miss a platform, Maximus begins to fall. You do not get the option to land on a lower platform. You get two sets of wings to save yourself from falling down. If you don’t have wings, the Maximus dies and you start over again. When Maximus dies, a small image of Maximus as an angel floats up to the top of the screen. The end screen shows you how many bugs you killed and the time it took you to get to the top. ZAP First Jump comes with 20 levels of fun in Story Mode. Endless Mode has unlimited levels and playing time. 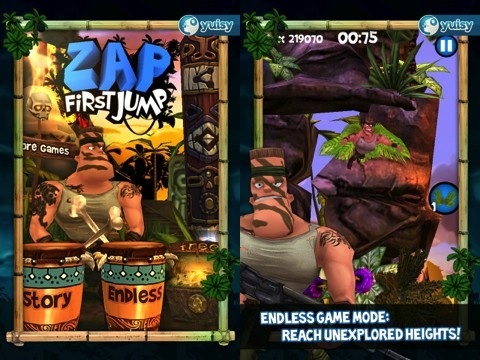 The graphics in ZAP First Jump are unique and use detailed beautiful graphical Sound effects for the game include tribal music, jungle noises and a crunching sound when you squash a bug. This game is played in portrait mode. The biggest flaw in ZAP First Jump is the main splash menu screen. It shows Maximus with two drums and a tribal pole next to him. On the tribal pole are three blinking lights but nothing indicates what these buttons go to. The first one is the social media sharing aspect. You share with Facebook, YouTube and Twitter. The next button shows the credits for this iPhone app. The third button shows the settings menu where you turn on/off sound, music and vibration. At the very bottom of the tribal pole is a chest marked “Free.” This button leads you to a screen where you earn more “Zap” points by performing tasks. ZAP First Jump is free to download to your iOS device. In my opinion, this is game is fun but I would not be willing to pay a fee for this app. This review of ZAP First Jump was crafted using an iPhone 4. AppSafari review of ZAP First Jump was written by Darius Reimm on April 10th, 2012 and categorized under App Store, Free, Games, iPad apps, Physics Based, Universal. Page viewed 3781 times, 1 so far today. Need help on using these apps? Please read the Help Page.